The Comics Code Authority was administrated by the Comic Magazine Association of America from 1954 through 2011. The Code arose as a result of moral panic that culminated in Senate Subcommitee Hearings into comic books and juvenile delinquency. It would be used by the industry to self-regulate content, which frequently included censorship. 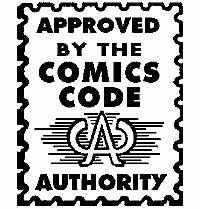 The Comic Book Legal Defense Fund acquired the rights to the Comics Code Seal of Approval in 2011 when the dissolving CMAA donated those rights to help the Fund protect free speech. This section provides a history written by Dr. Amy Kiste Nyberg and the original text of each version of the Comics Code and its predecessor, the ACMP Publishers’ Code.